Let’s get this train a movin’! I don’t really have much of a sweet tooth but I often find myself craving salty/ sour things. I have discovered that I adore giardiniera, which is pretty popular here in Chicago, and you will see it served as an appetizer in Italian restaurants, or. else you can pile it on top of your Italian beef or sausage, or even put some on your pizza. 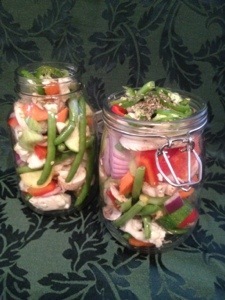 The stuff you buy in the store pre made in jars is good enough… but the home made stuff is good on steroids! I started with this recipe. I added some of my favorite veggies… zucchini and yellow squash, green beans and mushrooms. I cut back on the celery cuz I am not much of a fan… and I added extra garlic. I found the liquid ingredients to be not quite enough… so I ended up adding another cup of vinegar and water. Also I added some crushed red pepper flakes, because I add them to almost everything I make. One is not supposed to eat this for two or three days after sitting in the fridge, but I just had to try after a few hours… and it was the best I’ve ever had at any time, anywhere. If you like a non fat, healthy, tangy snack or condiment…. here ya go! Mi Casa Mexican Restaurant In Costa Mesa CA | OC’s Best Taco Tuesday! Best potatoes on the planet!!! Breakfast for dinner….fabulous French toast!